Khosrozadeh, I., Talaghat, M., Roosta, A. (2018). Optimization of Semiregenerative Catalytic Naphtha Reforming Unit to Enhance Octane Number and Reformate Yield. Iranian Journal of Chemical Engineering(IJChE), 15(2), 52-64. I. Khosrozadeh; M.R. Talaghat; A.A. Roosta. "Optimization of Semiregenerative Catalytic Naphtha Reforming Unit to Enhance Octane Number and Reformate Yield". Iranian Journal of Chemical Engineering(IJChE), 15, 2, 2018, 52-64. Khosrozadeh, I., Talaghat, M., Roosta, A. (2018). 'Optimization of Semiregenerative Catalytic Naphtha Reforming Unit to Enhance Octane Number and Reformate Yield', Iranian Journal of Chemical Engineering(IJChE), 15(2), pp. 52-64. Khosrozadeh, I., Talaghat, M., Roosta, A. Optimization of Semiregenerative Catalytic Naphtha Reforming Unit to Enhance Octane Number and Reformate Yield. 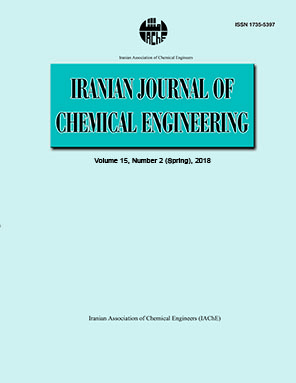 Iranian Journal of Chemical Engineering(IJChE), 2018; 15(2): 52-64. Catalytic naphtha reforming is one of the most important processes in which, low quality naphtha is converted into high octane motor gasoline. In this study, a mathematical model was developed and was used for investigation the effect of temperature, pressure, hydrogen to hydrocarbon ratio on the octane number, the yield of product and the undesirable phenomena of coke deposition in a semiregenerative catalytic reforming unit. The result of the model was compared to the plant data to verify the model accuracy. Then, the model was used to find the optimal condition for the maximum value of octane number and yield of product and the minimum value of coke deposition. The optimum condition of the process is estimated using genetic algorithm optimization method as an efficient optimization method. In the optimal condition, the octane number and the yield of the product are improved 0.3% and 1.23% respectively, and the coke deposition is reduced 2.1 %. Aitani, A. M., Catalytic naphtha reforming: Encyclopedia of chemical processing, Taylor & Francis, p. 397 (2007). Antos, G. J., Aitani, A. M. and Parera, J. M., Catalytic naphtha reforming: Science and technology, Marcel Decker Inc., New York, USA, p. 409 (1995). Pregger, T., Graf, D., Krewitt, W., Sattler, C., Roeb, M. and Moller, S., “Prospects of solar thermal hydrogen production processes”, Int. J. Hydrogen Energy, 34 (10), 4256 (2009). Alves, J. J. and Towler, G. P., “Analysis of refinery hydrogen distribution systems”, Eng. Chem. Res., 41 (23), 5759 (2002). Liu, F. and Zhang, N., “Strategy of purifier selection and integration in hydrogen networks”, Chem. Eng. Res. Des., 82, 1315(2004). D'Ippolito, S. A., Vera, C. R., Epron, F., Especel, C., Marecot, P. and Pieck, C. L., “Naphtha reforming Pt-Re-Ge/g-Al2O3 catalysts prepared by catalytic reduction influence of the pH of the Ge addition step”, Appl. Catal. A Gen., 370, 34 (2009). Rahimpour, M. R., Iranshahi, D., Pourazadi, E. and Bahmanpour, A. M., “Boosting the gasoline octane number in thermally coupled naphtha reforming heat exchanger reactor using DE optimization technique”, Journal of Fuel., 97, 109 (2012). Juarez, J. A., Macias, E. V., Garcia, L. D. and Arredondo, E. G., “Modeling and simulation of four catalytic reactors in series for naphtha reforming”, Energy & Fuels., 15, 887 (2001). Weifeng, H., Hongye, S., Shengjing, M. and Jian, C., “Multi objective optimization of the industrial naphtha catalytic reforming process”, Chin. J. Chem. Eng., 15 (1), 75 (2007). Rahimpour, M. R., Iranshahi, D. and Bahmanpour, A. M., “Dynamic optimization of a multi stage spherical, radial flow reactor for the naphtha reforming process in the presence of catalyst deactivation using differential evolution (DE) method”, Int. J. Hydrogen Energy., 35 (14), 7498 (2010). Benitez, V. M. and Pieck, C. L., “Influence of indium content on the properties of Pt-Re/Al2O3 naphtha reforming catalysts”, Catal. Lett., 136, 45 (2010). Boutzeloit, M., Benitez, V. M., Mazzieri, V. A., Especel, C., Epron, F., Vera, C. R., Pieck, C. L. and Marecot, P., “Effect of the method of addition of Ge on the catalytic properties of Pt–Re/ Al2O3 and Pt-Ir/ Al2O3 naphtha reforming catalysts”, Catal. Commun., 7, 627 (2006). Mazzieri, V. A., Pieck, C. L., Vera, C. R., Yori, J. C. and Grau, J. M., “Analysis of coke deposition and study of the variables of regeneration and rejuvenation of naphtha reforming trimetallic catalysts”, Catal. Today, 135, 870 (2008). Sugimoto, M., Murakawa, T., Hirano, T. and Ohashi, H., “Novel regeneration method of Pt/KL zeolite catalyst for light naphtha reforming”, Appl. Catal., 95, 257 (2006). Anabtawi, J. A., Redwan, D. S., Al-Jaralla, A. M. and Aitani, A. M., “Advances in the chemistry of catalytic reforming of naphtha”, Fuel. Sci. Technol. Int., 9 (1), 1 (1991). Berger, C. V., Denny, R. F. and Michalko, E., “Chemistry of HC plat forming”, American Chemical Society, Division of Petroleum Chemistry, Reprints, 23 (3), (1978). Bird, R. B., Stewart, W. E. and Lightfoot, E. N., Transport Phenomena, 2nd ed., Wiley, New York, p. 183 (1924). Taskar, U. and Riggs, J. B., “Modeling and optimization of a semi regenerative catalytic naphtha reformer”, AICHE J., 43, 740 (1997). Arani, H. M., Shokri, S. and Shirvani, M., “Dynamic modeling and simulation of catalytic naphtha reforming”, Int. J. Chem. Eng and Appl., 1 (2), 159 (2010). Bommannan, D., Srivastava, R. D. and Saraf, D. N., “Modelling of catalytic naphtha reformers”, Can. J. Chem. Eng., 67, 405 (1989). Smith, R. B., “Kinetic analysis of naphtha reforming with platinum catalyst”, Chem. Eng. Prog., 55 (6), 76 (1959).